The Policy Daddy cares so much about spreading the word regarding the need for responsible budget policy that he is putting his body, and pride, on the line this coming Friday. I will participate in the Budgetball on the Mall tournament on the National Mall in Washington, DC on May 21 starting at 3 pm. Budgetball was created as a unique way to get youth and others to think about sound budgeting. It’s the only sport I know of that involves oven mitts, though there may be a few cooks who take issue with that. The game is hard to explain. It’s best to check out the website at www.budgetball.org/crfb/. Better yet, come out on May 21 and see for yourself. Likewise, administration officials calling for more public funds to be pumped into the economy consistently refer to the need for a “jobs bill” as opposed to another “stimulus.” The White House has obviously conceded the messaging battle over the stimulus and has decided that the better part of valor is to regroup and re-market the concept. Many voters feel they have benefitted little from the stimulus; terms like “recovery” and “jobs” are what they want to hear. David Sanger of the New York Times writes that U.S. debt could hurt its global standing. Unless miraculous growth, or miraculous political compromises, creates some unforeseen change over the next decade, there is virtually no room for new domestic initiatives for Mr. Obama or his successors. Beyond that lies the possibility that the United States could begin to suffer the same disease that has afflicted Japan over the past decade. As debt grew more rapidly than income, that country’s influence around the world eroded. Similarly, Gerald Seib of the Wall Street Journal warns that mounting debt is a threat to national security. The U.S. government this year will borrow one of every three dollars it spends, with many of those funds coming from foreign countries. That weakens America’s standing and its freedom to act; strengthens China and other world powers including cash-rich oil producers; puts long-term defense spending at risk; undermines the power of the American system as a model for developing countries; and reduces the aura of power that has been a great intangible asset for presidents for more than a century. Former CBO Director Douglas Holtz-Eakin and former House Budget Committee Chairman James R. Jones also argued recently that American debt has international implications. From Afghanistan to China to Copenhagen, the actions of President Barack Obama have international significance. However, the greatest worldwide implications will stem from a domestic issue that he must not ignore: our nation’s mounting government debt. The U.S. has a debt problem, and the world is watching. The administration’s response will dictate not only the standard of living of future generations of Americans, but also their country’s global standing. In discussing his “Fiscal Democracy Index” in USA Today economist Gene Steuerle contends that unsustainable promises are crowding out the ability of government to undertake any new initiatives to improve the nation or meet the needs of the next generation. Thanks to decades of promises for ever-higher benefits and low taxes for the indefinite future, there’s now less give in future budgets than at any point in American history. At least profligate Congresses in the past confined their excesses and temporarily large deficits to the current year. Until recently, they didn’t box in the future. Underscoring all of this, Moody’s warned that the nation’s AAA bond rating is at risk because of debt and slow growth. Dealing with our debt in a thoughtful and forward-looking way must be a national priority. Today much of Washington stood still as many plodded through the hundreds of pages and myriad graphs, charts and tables in the White House Budget request for fiscal year 2011. It is an annual rite in Washington that the first Monday in February be spent this way. Though thanks to modern technology the materials are available on the web nowadays, as opposed to a hapless intern or low-level staffer having to trudge to the Government Printing Office bookstore and haul a good 15+ (depending on the number of copies) pounds of dead tree back to the office. Been there, not cool. Now that “Jersey Shore” is done for the season, this is a good way for those outside the beltway to kill some time before the season premiere of “Lost” tomorrow night. The budget is where Washington puts the (taxpayers’) money where their mouths are. The politicians can talk about what they want to do, but the budget process is where they have to at least have some semblance of prioritizing; though the process currently is so dysfunctional and marred by gimmicks and budgetary slight of hand that such accountability is diminished. Today we got an idea of President Obama’s priorities. As Congress rips through the request we will get some idea of theirs. A large and persistent imbalance between federal spending and revenues is apparent in CBO’s projections for the next 10 years and will be exacerbated in coming decades by the aging of the population and the rising costs of health care. That imbalance stems from policy choices made over many years. As a result of those choices, U.S. fiscal policy is on an unsustainable path to an extent that cannot be solved by minor tinkering. The country faces a fundamental disconnect between the services that people expect the government to provide, particularly in the form of benefits for older Americans, and the tax revenues that people are willing to send to the government to finance those services. That fundamental disconnect will have to be addressed in some way if the nation is to avoid serious long-term damage to the economy and to the well-being of the population. That’s the problem in a nutshell. And it will be a tough nut to crack. Although voters are growing increasingly concerned about rising federal deficits and debt, we need to recognize that addressing the issue will require all of us to prioritize how we want our tax dollars collected and spent. We are finally doing it at home and we must now also bring that same new-found sensibility to what we expect of our government and what we expect to pay for. Our leaders will have to make some tough decisions and we cannot let demagogues cloud the debate. Do we need a Debt Czar? The Senate is currently trying to raise the statutory debt ceiling for the country. 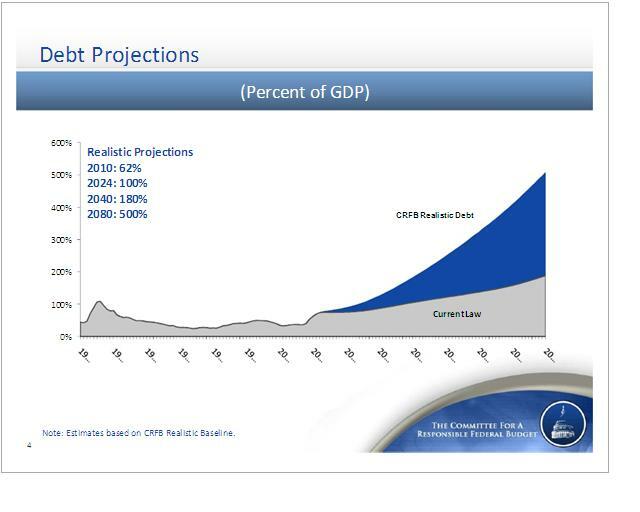 Our debt is projected to reach the limit next month. If we reach the limit, then the government will no longer be able to issue debt, which would mean we could no longer pay our bills. The U.S. has been on an unsustainable fiscal course for some time. The recession and measures to combat it have exacerbated the situation. As Congress and the White House seek to calm voters angry over the fiscal recklessness is Washington, as well as markets and creditors concerned about our ability to meet our financial obligations, they are considering several proposals to address a fiscal crisis that many see coming. So, given the proclivity of this administration to appoint “czars” to address critical issues; do we need a Deficit Czar? My answer is “no,” considering that the numerous czars already in place have little to show in the way of success. Depending on who’s counting, we have between two and three dozen czars dealing with issues such as health care, climate, the economy, and the auto recovery. But something needs to be done to prompt action and show that we as a nation are serious about tackling the debt. A more promising idea is a commission to address the long-term fiscal challenges. Granted, commissions in Washington don’t have such a great track record either. Many well-intentioned panels with impressive membership have held hearings, deliberated in earnest, and issued thorough reports, only to see their proposals gather dust. However, the fiscal commission proposal that the Senate will vote on Tuesday would be different. Under the legislation being considered, Congress would be required to vote up-or-down on the recommendations of a bipartisan fiscal task force. Since our leaders in Washington have been reluctant to address the dilemma in a responsible way by making the difficult, yet necessary, decisions to get the country’s fiscal house in order. Perhaps a commission with some teeth could spur action.